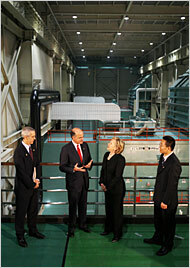 Secretary of State Hillary Clinton at the Taiyanggong Geothermal Plant in Beijing on Saturday. During her visit to China over the weekend, Secretary of State Hillary Clinton convinced the nation to work with the U.S. to curb greenhouse gas emissions. The two countries have been at odds over human-rights issues, but will put their differences aside to tackle the issue of global warming. According to a recent New York Times story, Clinton told the press that although human rights issues are important to the country, she couldn’t let the issue stand in the way of other urgent areas of discussion. China and the U.S. lead the world in carbon dioxide emissions, accounting for 40 percent of the world’s emissions. As is noted on the website of the United Nations Framework on Climate Change (UNFCC), China is a member of the Kyoto Protocol, but the United States isn’t. The Kyoto Protocol was designed to strengthen the international response to climate change. The following website outlines the specific goals of the protocol’s signatories. China’s commitment to reducing greenhouse gases is debatable. China’s foreign minister, Yang Jiechi, confirmed that his nation had agreed to work on the issue with the U.S., but didn’t indicate any specific plans to achieve this goal. “The two sides believe that energy and the environment will play an increasingly important role in the growth of bilateral relations,” Jiechi was quoted as saying in the Chicago Tribune story. Given the turbulent history between the two countries, it is tough to say how successful their new partnership will be, but both seem to be dedicated to the issue, at least for the time being. “This is not a matter of politics, or morality or right or wrong,” Clinton was quoted as saying in the New York Times story. “It is simply the unforgiving math of accumulating emissions”.